Space Saving Design. 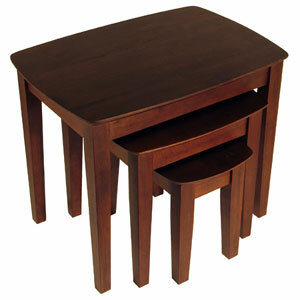 This Nesting Table Set Has Simple Lines And Traditional Good Looks. Each Table Has A Rounded Rectangular Top And 4 Tapered Legs. Beautiful Antique Walnut Finish. Solid And Composite Wood Construction. Strong Construction. Easy To Assemble.